Some people around me love to splurge money on things I consider are not important. I see they mostly do it when it involves a sale or they think they are getting a great deal. On occasions I hear people complain of how pricey a restaurant is. When I ask if anything went wrong the replies don’t necessarily make it a pricey restaurant under my terms. They usually say the food was delicious, service was great, location is beautiful and secure, and they had a nice experience but the price of the plate was not attractive to them. For me a pricey restaurant is one that did not meet up to the expectations. A pricey restaurant can be a fast food that offered you one option and then gave under par food. Sometimes we get so caught up in the environment the restaurant is creating and it makes us ignore the prices on the menu. If you are part of the team that designed the menu, the restaurant owner, and/or manager, you have done your job at creating a great ambiance when your patrons stop focusing on pricing. In Puerto Rico so many people focus on having discounted food. The masses sadly focus more on quantity vs. Quality. They might even spend 12 dollars for a subway sandwich that is mass-produced and then complain about a 20-dollar plate at a nice sit down restaurant serving quality organic food. They’re so focused on price and they ignore the fact of comparing different products to the same price. At CIMA IT we have helped restaurants with their pricing strategies and menu enhancements. Where we bring the real value is finding clientele for our customers that are seeking an awesome experience and are not so focused on pricing? We help restaurants in getting tourists who are on vacation and are seeking to have a unique experience into the dining room. This is done by nurturing a healthy relationship with the patron before they step foot in the restaurant. By setting up a website that is attractive, clean, and most importantly functional. We can entice website visitors into clicking the reserve a table button while giving them a touch of what they will experience if they visit the restaurant. Making sure the restaurant stands out from others even if the patron at the end of the visit is focused on price. I will go into the details via my newsletter where I will share more details on restaurant strategies. If you are a restaurant owner and would like to receive this via email feel free to sign up. By building websites or when we coach clients on how to enhance their online presence we tend to improve the results for any efforts they where running. Increasing the probability of success for any investments clients make. By building processes that are practical and can be repeatable differentiates us from other companies giving away certain services. It also keeps clients that are being penny wise and dollar foolish away from hiring us. Value, quality, and price sometimes might not go in hand although many might disagree. How do you make sure that those three elements are as close as possible from each other? I am a big fan of Foursquare and I can confess I use it daily. I try to check-in at most places, like I did on my visit to La Casita Blanca, I visit with hope than local business owners and management will hand out some type of perks. As of right now it is just for the bragging rights and studying how other people interact on the platform. I was very privileged to listen to @dens (Dennis Crowley, Foursquare Founder) during the @cmsummit and became even more engaged with the Social Mobile Game. Last week I was reading @chrisbrogan’s blog as I am big fan of his and his post and he did made me focus on what is important. His post titled “Go Map Yourself” focused on how many people are so focused on being the Mayor of Foursquare than being the Mayor in Real Life. For the last few days after reading his post I did realize that I was getting treated even better than what some Foursquare mayors (I am still working on the discounts and loyalty perks, LOL). I did realize that even though the @starbucks I most frequently visit is duplicated on Foursquare and I am the mayor most of the time of both their baristas will treat me the same check-in or not on Foursquare. 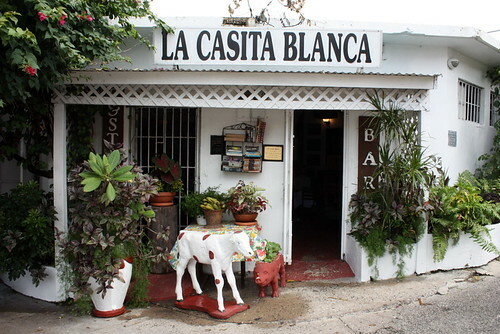 Yesterday I had the opportunity to visit “La Casita Blanca” Restaurant in Santurce with a client. (following images where provided by @moncheoPR’s blog. This place can serve as good case study on how to treat your patrons no matter who you are. I had heard on many occasions about the restaurant but being vegetarian it is very difficult to go and enjoy most “Puerto Rican Restaurants” since they are certainly not veggie friendly. I decided to go to “La Casita Blanca” since I skipped the gym this week during lunch, because my Personal trainer is on vacation (I just can’t seem to train without his guidance, I guess I can blame him for not visiting the gym this week). I was told up front that they’re where no Vegetarian options but I wanted to spend time with the people at my client so I went anyway. On the way their I kept hearing how they where craving some “bacalaitos” (salt cod fritters). 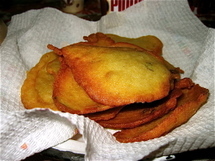 items such as a basket of “bacalaitos”, cup of soup, and a basket of garlic bread is placed at your table. This is even better treatment (even though I did not consume any of the items) that what I get at other restaurants where I visit frequently and I am loyal customer. Which made me think of the Title of this Blog Post, I had never checked in on foursquare or was I a celebrity to get the special treatment I got. I did not even request anything from the Menu (the staff was so nice and helpful they kept offering me food options). Once the meal was done they asked everyone on the table if they wanted coffee or dessert and brought a complimentary shot of Chichaito. What “La Casita Blanca” does to Exceed Expectations? No matter how much you are spending as long as you are sitting down at the table you get the VIP treatment. They stand out from any other restaurant since not many restaurants now days offer a complimentary snack. The restaurant gives a feeling for eating at a friend or family member’s house. Plates where perfectly presented. I was amazed on how appealing the plates appeared to my view (A bit difficult to say when you are vegetarian and the plates main entrée is a big piece of meat). Overall even though I did not eat anything I was so amazed by the experience and how well I was treated that I decided to write this post. 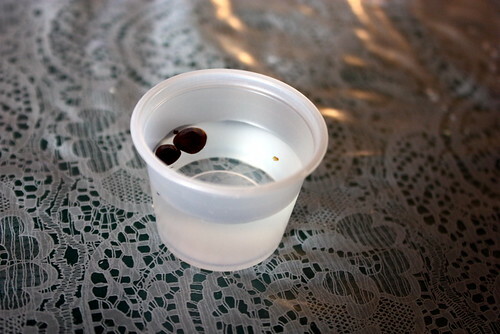 I guess it is the least I can do for them after actually trying the Chichaito without consuming a plate. During my college years I worked as a waiter in my hometown of Ponce and I lately I have been involved in helping a few restaurants (@archipielagopr being one of them) linking technology (social media, websites, etc) to their business goals for my consulting practice CIMA IT Solutions (http://cimapr.net). I think many restaurants should copy a thing or two on how “La Casita Blanca” operates and apply it to their business model. So to everyone if you are not getting treated well at the places you checkin please visit La Casita and you will be amazed and wonder why it is not that way everywhere else. Do You have any other favorite location where you feel the same way I felt at “La Casita Blanca”. Parking: Around the street. Good luck! Island politicians are said to have the best noses for good home cooking. We don’t know if that is true or not, but one of their favorite places is this eatery. Governor wannabes (What politician doesn’t want to be?) 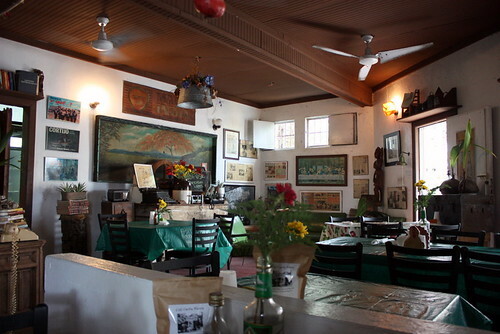 come here to order excellent regional fare, and enjoy an ambiance that oozes the culture of the Puerto Rican countryside. This is a converted family home that opened its door to diners in the mid-1980s, and it’s been a favorite of locals from all walks of Puerto Rican society ever since. Off the tourist trail and best reached by taxi, the restaurant does down home island fare like guisado y arroz con gandule (beef stew with rice and small beans), or bacalao (salt codfish with yucca). Guaranteed to put hair on your chest is patita (pigs’ trotters in a Creole sauce). Veal with sautéed onions is popular, as is grilled red snapper or chicken fricassee. 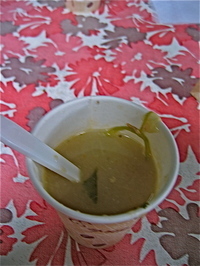 A typical chicken asopao, a soupy rice stew, is also served. If you ever wanted to try stewed rabbit or goat, this is the place.